The Rabbi with a Blog (Rabbi Jason Miller): Summer Camp's Expensive. Is Crowdfunding the Answer? Summer Camp's Expensive. Is Crowdfunding the Answer? I was talking recently about Camp Inc., the Jewish summer camp in Colorado for kids interested in business and entrepreneurship. The conversation turned to the high cost of tuition for summer camp and how some kids are choosing to work all summer long so they can pay for their summer camp experience or trip to Israel the following year. The problem with that of course is that they miss out on an entire summer of camp memories. 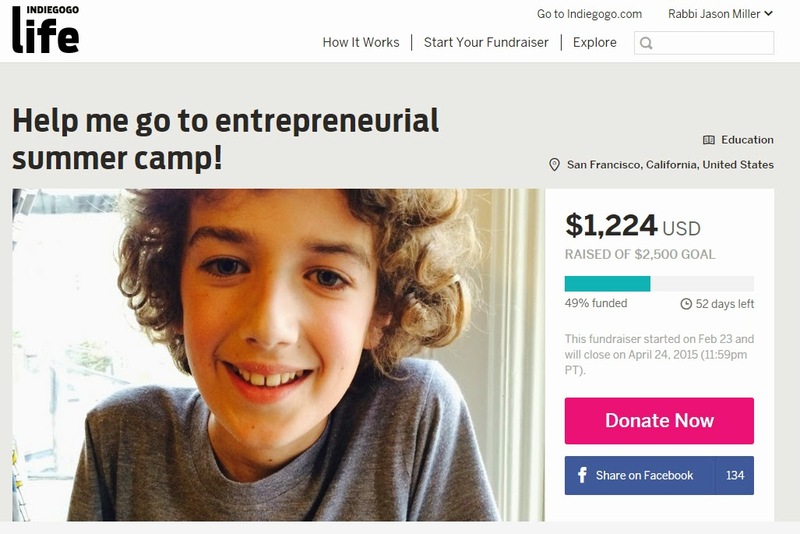 That's when I learned about an 11-year-old kid from the Bay Area named (ironically) Cash, who in true entrepreneurial fashion, has launched an Indiegogo campaign to raise money for his Camp Inc. tuition. As soon as he launched his fundraising page I reached out to his mother to learn more about this innovative young man who just might be on to something here. Will we see more kids take to the internet to make their case on crowdfunding websites and solicit funds for their summer camp experience? What about Spring Break vacations or college tuition? It’s a known fact that many Jewish kids head out to overnight camp each summer. In fact, Jeremy J. Fingerman, the CEO of the Foundation for Jewish Camp, believes that in any one summer, as many as 11% of the approximately 700,000 Jewish kids ages 7-17 in North America are enrolled in a Jewish camp. These are no longer simply the traditional overnight summer camps of previous generations in which campers and counselors swim, sail, and sing Jewish songs by the campfire while roasting s’mores. Today’s listing of Jewish summer camps includes dozens of “specialty camps” that focus on specific interest groups like science and technology, the culinary arts, health and wellness, and sports. These camps, which run anywhere from one to eight-week sessions, require a significant financial investment from parents who want their children to enjoy meaningful experiences over the summer vacation. Financial scholarships and significant subsidy programs like the Foundation for Jewish Camp’s BunkConnect help defray a portion of the tuition costs, but money is still an impediment for many families. One pre-teen in the Bay Area was so determined to attend a specialty Jewish camp this summer that he recently launched his own crowdfunding campaign. When 11-year-old Cash Ashkinos of San Francisco learned about Camp Inc., a Colorado-based overnight camp with a strong focus on entrepreneurship, he knew he was destined to attend. The problem was the cost, so Cash is hoping to fund his summer at Camp Inc. by raising contributions through the website Indiegogo. Cash first learned about Camp Inc., which opened in the summer of 2014, when the camp’s director, Josh Pierce, visited his synagogue’s Hebrew school. Cash was so intrigued that he asked the director to contact his mother. Tanya Schevitz, who works for the Jewish think tank Reboot, knew right away that Camp Inc. was the type of camp that her son would love.